At HubSpot, we study human behavior and then build products to match the way modern buyers shop, learn, and communicate. Observing how people discovered content via search in Google was our first big insight and it formed the foundation what we’d eventually call “inbound marketing”. Later, having observed how people consumed content they’d subscribed to, we moved aggressively into marketing automation. In the last few years we’ve observed a new behavior: The rise of messaging and chat. It’s everywhere. We’ve all experienced chat replacing the phone call as the core means of getting support. Many have likely even transacted online purely based on a chat conversation (as I did the other day while buying insurance). At HubSpot, Slack has taken over as the predominant means of communication internally, eating into the steady flow of email. And, while new to some folks, Facebook Messenger now has over 1.3 billion users. While the trend towards messaging was obvious — the key question remained how we could make it work for our customers. To get there we started with a simpler question: How could we make it work for ourselves? We asked our marketing team to see if they could leverage this transition to find a new way to reach our prospects, have better conversations, and ultimately grow our business. With that mission the team tried a few products, iterated through a few tests, and once they found a thread of success — pulled at it hard. What they found was bots — and Motion AI. Ten years ago the primary way folks communicated externally was via email. Marketers could send one-off emails themselves, but if you wanted to automate those responses — generating a better, more personalized message — you needed an engineer to pull it off. Today, the way folks communicate externally is shifting towards messaging. Large companies manage these via live chats with an army of employees responding in real time. Few companies can pull that off. If you’re a smaller company or want to automate those communications you need an engineer to pull it off (or in HubSpot’s case with Growthbot, you need a Dharmesh). What our marketing team discovered was that they could use Motion AI to extend the benefits of marketing automation to messaging. They were able to turn messaging into something that mere mortals could use and produce bots in minutes or hours versus days or months of developer time. Our Motion AI bot loves you too, Jonathan! Subscribing to content. Giving users who discovered us on Facebook the option to subscribe to content directly via Facebook Messenger (without having to leave Facebook). People, well, loved our bot for this. Event outreach. Giving attendees of our local HUGS a chance to receive updates and ask questions in real time via Facebook Messenger. Qualifying leads. Responding to questions on site, taking information from the prospect first (replacing the form), and scheduling time on the right sales rep’s calendar via our HubSpot Sales platform. Announcing an acquisition. Okay, this one is cheating a little — but I think it’s a pretty exciting use case. Go check out Motion AI in action yourself at HubSpot.com/bots. I’m proud to announce that Motion AI is joining HubSpot to bring this technology to all users of HubSpot. I love this story: HubSpot unleashed our marketing team on a new space to find what works, then took every step necessary to get that power into the hands of our customers. Over the coming months, Motion AI will be integrated into the HubSpot platform. New signups of Motion AI will be temporarily paused to give our teams a chance to come together and create a simple, remarkable product experience for our joint customers. 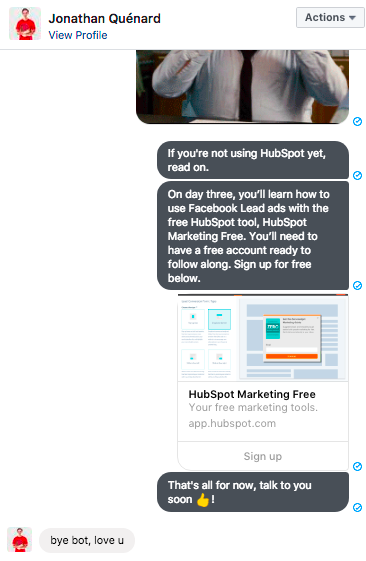 HubSpot users of all sizes will have access to the top bot maker (in terms of bots deployed — as far as we can tell) on the market. Chatbots built with Motion AI and HubSpot will have access to all the data that lives in a company’s CRM and marketing tools to deliver more helpful conversations. Customers will be empowered to automate messaging on whatever channel their customer prefers — be it website chat, Facebook Messenger, Slack, or other platforms we expose over time. Welcome to the Motion AI team — and to the next phase of marketing automation.